Every time I bring this subject up in conversation I usually get a flip-flop, hand bag or another ladies weapon of choice thrown at me by my better half. But as she has no idea I am do this blog my eyes are safe from being blackened, at least for now anyway. When my wife Dee and I booked our honeymoon we wanted to enjoy some culture and relax at the same time so we had a week in Dubai and a second week in the Maldives. Now I had attempted to dive at the age of 12 in a wet suit (yes wet suit, not a semi dry and most definitely not a dry suit although I have had a few dry suits that certainly acted like wet suits) out of Weymouth in January. This was not my idea of fun and needless to say that was where I left it, no Open Water certificate for me. Knowing this Dee said to me “as we are going to the Maldives we should try a dive, after all I know it is something you have always wanted to do”. Instantly I felt excited. However it dawned on me that my better half (just in case she reads this) can’t even put her head under the shower without flapping her hands and making a noise that could only be described as a rabid turkey that was about to go the slaughter house (brownie points gone). After being transferred by speed boat to our Atoll, and Dee had recovered from sea sickness. 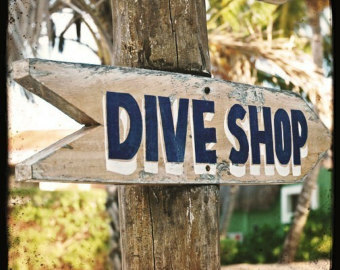 I thought I best leave it a day or two before subtlety falling over the wooden made arrow sign that displayed “dive shop this way”. oh Hun look …. All suited up and bobbing at the surface in the sea it was time to descend. It was time to clear the mask, oh yes that skill we all love with the same passion as waiting in the queue at the post office. I went first “let a little water in, look up and blow out through your noise. The instructor demonstrated first and said to me (in perfect sign language obviously) over to you. At only 1.5m depth this is going to go one of two ways, I thought to myself, the second way is going to look a lot like a beer on the beach in about 30 seconds time and a sign of relief which in turn will say been there, done that, ain’t doing it again, time to take up bridge. I did it with relative ease which I wasn’t expecting and looked over to Dee with a reassuring glance although her eyes had filled her mask with a look of, I am going to beat the !”£$ out of you when we are done here. I gulped and began to pray. The instructor demonstrated the skill once more and signalled to Dee “over to you” I was nervous, but this is where it happened a moment I will never forget. Dee let the water in and Boom panic had its grip, straight away she signalled UP UP UP. The instructor held her arm and looked straight at her, their eyes locked, he pointed to his nose and stared tapping it. My wife wrestled with the demon knowing this is the only way she is going to get to the surface she tilted her head up, pushed the top of her mask, blew through her noise and there it was a clear mask and a look of amazement. You could see it clear as day, I’m ok and that is salt water, it isn’t sulphuric acid up my noise after all. Off to 12m we went. We came up after the dive full of excitement and that was when the instructor said “well that’s dive 1 of your open water done”, “want to do the open water course”?….. If it was wasn’t for that excellent instructors simple action my wife would not have become the excellent Dive Master she is today and enjoyed (most of) the dives we have done together. All 150 plus of them. But credit where credit is due this is where I learned a valuable lesson don’t fight the Dee-mond. Similar type of sign I fell over *cough*..